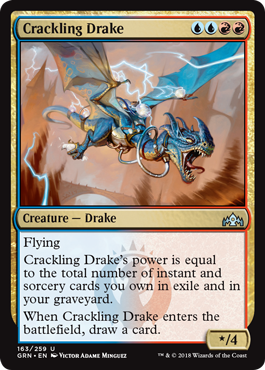 Wizards of the Coast gave us this great, cool, preview card: Crackling Drake! … That doesn’t mean that you can’t play it with Dragons. 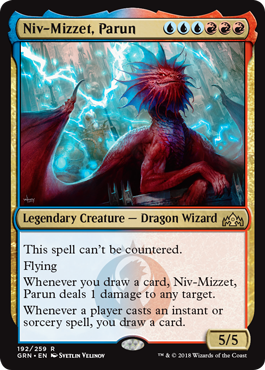 At UURR casting this card on turn four consistently is going to be a challenge. At least, you are going to have to build a specialized mana base for it. Crackling Drake may not be a Dragon, but it can possibly play well with Dragons… One Dragon in particular. Both of these cards really like instants and sorceries. The four mana Drake gets more power from casting instants and sorceries, while the six mana Dragon draws extra cards. Crackling Drake draws a card when it enters the battlefield. THAT IS REALLY GOOD! The Drake also counts both the graveyard and exile. This is an important point for a couple of reasons… In powered formats, you can cast Demonic Consultation to do dozens of damage on the spot. In Standard, there is a huge advantage to playing jump-start cards. They go together like peanut butter and chocolate.